Melanie Smith of CSKT Tribal Social Services, addresses the Polson City Commission about developing an alliance between the city and the tribes in an effort to combat the area’s drug problems. POLSON — A call for support of a school program that brings awareness of the drug/substance abuse problem and its affect on children was brought before the Polson City Commission on Monday, Feb. 1. Melanie Smith of Tribal Social Services asked for an alliance between the City and the Tribes in support of the Core Drug Endangered Children Training Program also known as ‘Handle With Care’ that has been implemented in Polson Schools. Mayor Heather Knutson agreed that there needs to be an improved approach to the drug problem and its affect on families in the Polson community. Smith asked the commissioners for help in “developing an alliance” between the tribes and the city. Polson is the first school district to implement the Handle With Care program. In other business, Kevin Johnson, DOWL engineer, reviewed the history of the new wastewater facility project. He gave commissioners an update on the structural foundation, listing important dates and stages that have enabled them to reach this stage in the project that began in January 2013 and is currently in its final design. Johnson is excited for the new equipment and reiterated the importance of the public being careful about what they flush down their toilets and how it creates problems for the wastewater treatment plant. “Somehow people get rags and diapers down their toilets,” Johnson said. 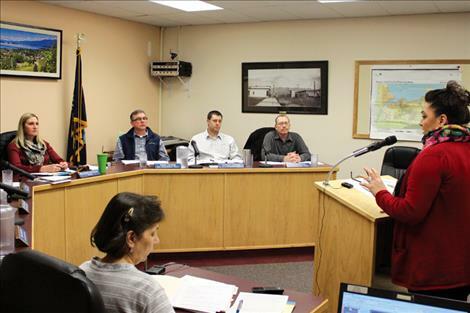 The next Polson City Commission meeting is Wednesday, Feb. 17 at 7 p.m. at City Hall.